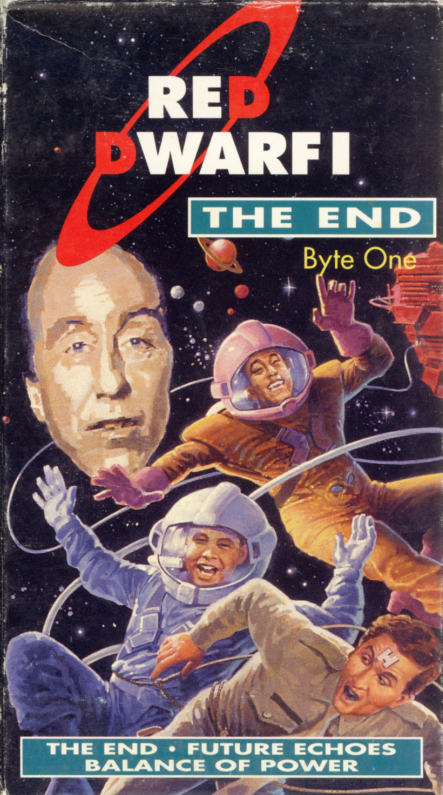 Red Dwarf I: The End on VHS. Starring Chris Barrie, Craig Charles, Danny John-Jules, Norman Lovett. Created and written by Rob Grant, Doug Naylor. 1988. THE VESSEL: The mining ship Red Dwarf. THE CREW: The slobbiest, most whacked-out bunch of spacebums and losers ever to set foot in an alternative reality. THE MISSION: To get back to Earth and have a wash. THE UNIVERSE WILL NEVER BE THE SAME AGAIN. A radiation leak wipes out the crew of the mining ship Red Dwarf, leaving only one survivor — Chicken Soup Machine Repair Man, Dave Lister. After three million years in suspended animation, Lister emerges to find he is the last human being in the universe. But he is not alone. When Red Dwarf breaks the speed of light, time dilates, and the crew begin to experience visions from their own futures. Sadly for Lister his future appears to include being reduced to his component atoms by a rather large explosion. Happily for Rimmer, Lister’s future appears to include being reduced to his component atoms by a rather large explosion. Rimmer encounters his most dangerous blood chilling challenge ever — Lister is taking the chef’s exam. If Lister passes he will hold sufficient rank to have Rimmer replaced as the ship’s hologram. Just how low will the universe’s most obnoxious dead man stoop to stop him?